The information presented here is unofficial. See below for more information. Victoria, Saanich Peninsula, West Shore, Gulf Islands, Greater Victoria. The data and fire danger ratings shown here are unofficial. These figures show the forest fire Danger Class Ratings calculated using data from the Vanvouver Island School-Based Weather Station network and the official formulae. 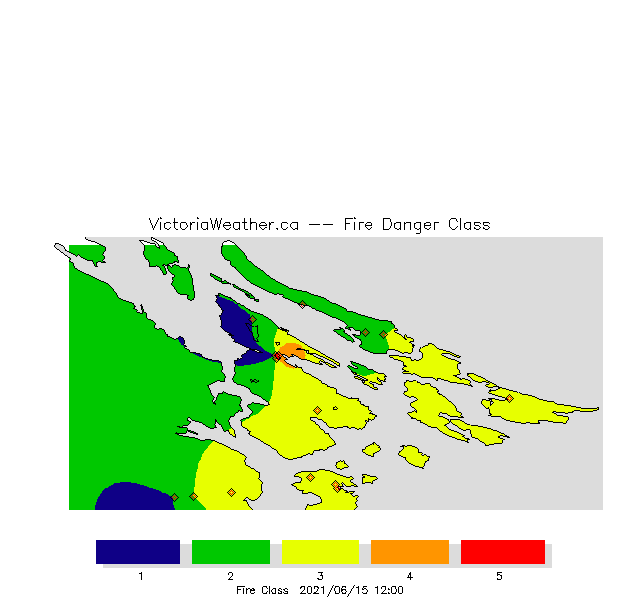 For more information and official fire danger estimates for Vancouver Island see the information at the BC Government Forest Service Protection Branch. More information on the Canadian Forest Fire Weather Index (FWI) System, including how it is calculated, is available from Natural Resources Canada. Very Low Very low fire danger. Moderate Carry out any forest activities with caution. High Fire hazard is serious. Extreme caution must be used in any forest activities. Burning permits and industrial activities may be restricted. Extreme Extremely high fire hazard. General forest activities may be restricted, including burning permits, industrial activities and campfires. This page took 2.6 ms to generate. Last Modified: March 19 2019 11:57:48.